Sunday, Mar. 25, 1888 Hardly as cold perhaps, but clouded over, & quite blustering again. 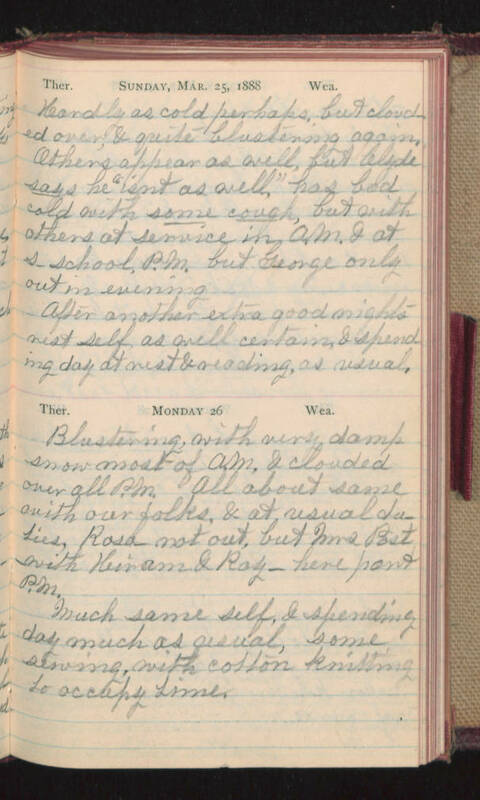 Others appear as well, but Clyde says he "isn't as well", has bad cold with some cough, but with others at service in A.M. & at s-school, P.M. but George only out in evening. After another extra good nights rest self as well certain, & spending day at rest & reading, as usual. Monday 26 Blustering, with very damp snow most of A.M. & clouded over all P.M. All about same with our folks, & at usual duties, Rosa not out, but Mrs Post with Hiram & Ray - here part P.M. Much same self, & spending day much as usual, some sewing with cotton knitting to occupy time.